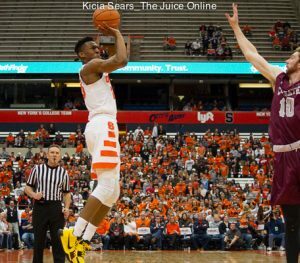 For the second time in three games, Syracuse trailed by 13 points with under 12 minutes remaining and rallied to force overtime, but this time could not pull out the win, dropping a 60-57 defensive scrum to St. Bonaventure at the Carrier Dome on Friday night. The Bonnies (10-2) brought with them a sizeable and loud contingent of fans, but more importantly, a hard-nosed defensive effort that forced the Orange (10-2) to struggle on offense throughout the contest. SU shot 30 percent from the field, including 7-of-33 (21.2 percent) after halftime and 2-of-10 in overtime. For good measure, the Orange were 3-of-19 from three-point range. 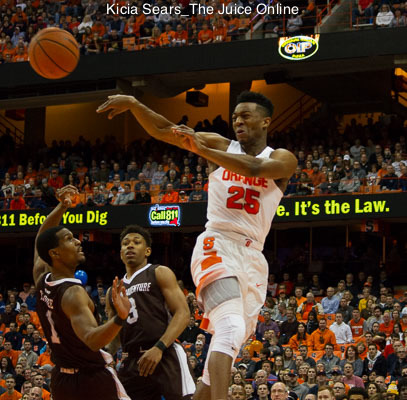 Tyus Battle, Oshae Brissett, and Frank Howard, who came into the night averaging nearly 52 points per game collectively for Syracuse, shot 12-of-47 (25.5 percent) from the field. Even as SU closed regulation by outscoring the Bonnies, 15-2, they made only three field goals in the final dozen minutes. Their defense was simply even better during that time, as St. Bonaventure mustered one field goal in the final 11:45 of the second half and overtime. The guests made only 32.7 percent of their field goals overall and 24 percent after the break. Even with the game being such a slog, drawing perhaps the most ire of both coaches, teams, and fanbases was the officiating, which could be generously described as “inconsistent”. The two teams combined to commit 23 fouls in the first half, then one in the first nine minutes of the second half. Shortly after, that span was backed up by a succession of five fouls on St. Bonaventure in a 77-second stretch. St. Bonaventure hung a run of nine straight points early in the game for a 9-3 lead and would eventually nudge that gap out to seven points on a couple occasions. After that second seven-point lead was gained, Syracuse needed only two-and-a-half minutes to wipe it out. Oshae Brissett knocked down a fadeaway jumper to get the Orange offense in gear, then Frank Howard stole the ball and went the length of the court for a bucket. The junior point guard then dished to Marek Dolezaj for a lay-in and to Brissett for a three. Brissett missed, but was fouled and made the first two from the line to cap the 8-0 run and give SU a 15-14 lead just shy of the middle of the opening half. The Bonnies responded by grabbing a three-point lead, but Syracuse struck back with eight of the game’s next ten points to reverse that. Brissett sank a pair at the stripe, then Howard dealt to Dolezaj again for a lay-up and an Orange lead. The guests added a lay-in to go back on top, but a series of SU free throws (Howard one, Brissett two, Dolezaj one), gave the hosts a 23-20 advantage with just over seven minutes to play in the half. Jaylen Adams of the Bonnies took that as a cue to go off. Adams scored 14 points in the final six minutes of the first half, including four three-pointers, as St. Bonaventure doubled its offensive output for the half and grabbed a 40-30 lead. Howard used a shot fake to get free and drilled a three-pointer for the Orange just before the buzzer to clip the halftime margin to seven points, then added another three for the first score after the break to make it a 40-36 game. The Syracuse offense went into the freezer at that point and the Bonnies scored the next nine points of the game for a 13-point lead. SU finally broke through for a basket, but St. Bonaventure replied in kind for a 51-38 lead with 11:45 to play. The Orange went into lockdown on defense, including using to its full-court press, to drag themselves back into the game. Tyus Battle hit a jumper and added a pair of foul shots. Howard made a steal that led to a free throw and Brissett would make the latter of a pair of foul shots to bring Syracuse within 51-44 with just over eight minutes on the clock. The Bonnies broke through with a dunk with 7:17 on the clock to push their lead back out to nine, but that would be their last field goal of the game. A minute later, Battle would drain two from the line and, another minute later, Howard did the same to pull the Orange within 53-48. Howard added a floater on the next SU possession to make it a three-point game. Neither team scored for over three minutes until Paschal Chukwu broke through with a three-point-play that knotted the contest at 53 with 1:18 to go. St. Bonaventure missed a pair of three pointers on their next trip, but neither Battle nor Brissett could convert for the Orange, sending the game to overtime. On the opening possession of overtime, Marek Dolezaj grabbed a pair of offensive rebounds and was eventually rewarded for his hustle with a lay-up for the first Syracuse lead since the first half. The Orange offense went into a drought once more and the Bonnies hung five foul shots in the interim for a 58-55 lead midway through the bonus time. Brissett sliced the margin to a single point by tapping home his own miss with just over a minute to play. SU held on the ensuing Bonnies possession and cleared the glass. Brissett drove for a scoop shot, but was called for an offensive foul, wiping away the score with under a dozen seconds to play. The Orange were forced to foul and Adams made them pay by connecting on both shots to make it a 60-57 game with six seconds to go. Syracuse ended up with Howard Washington getting the ball in the left corner, but his tying effort was blocked. An officials’ review of the play ruled that the ball was touched by a St. Bonaventure player before time elapsed and three-tenths of a second went back on the clock. That was not enough for the Orange, who could not get another attempt off. Frank Howard topped the Orange with 17 points while handing out a half dozen assists and gathering four steals. Oshae Brissett had another double-double, finishing with 15 points and 13 rebounds, while Tyus Battle fought through a 3-for-18 night from the field to tally 11 points. Marek Dolezaj just missed a double-double with nine points and ten rebounds. The freshman forward also blocked three shots before fouling out, a feat matched by center Paschal Chukwu. Jaylen Adams led all scorers with 23 points, piling up 21 points and four three-pointers before going silent until the final foul shots of overtime, and also had nine rebounds. LaDarien Griffin had nine points while Matt Mobley and Idris Taqqee each added eight to the Bonnies’ effort. The Orange return to action on Wednesday when Eastern Michigan will visit the Carrier Dome. The Eagles (8-3) saw a three-game win streak get broken on Friday night when they suffered an 86-81 loss at Oakland on Friday. Three different players are averaging at least 17 points per game for EMU. Forward Elijah Minnie leads the way with 18 points and just shy of seven rebounds per game. His frontcourt mate James Thompson IV, who has averaged double digits in scoring and rebounding in all three of his seasons with the Eagles, is posting 17.7 points and 12.4 rebounds per game this season. Paul Jackson is the third member of the high-scoring trio, hanging 17 points per outing. ESPN2 will televise Wednesday’s game, which is slated for a 7:00pm Eastern tip-off. The telecast will also be available online at ESPN3.com.